Time to create the painting “Sunny day. Spring “was the period of the 17th anniversary of the artist Isaac Levitan. The young man studied at the Moscow school of painting. The main direction of the master became landscapes. Perhaps it was not easy love of nature. Levitan was a student of the famous artist Alexei Savrasov, who, in turn, was a master of depicting the essence of the surrounding world. Attention should be paid to their friendly relations and joint vision of the essence of beauty of nature. It is also obvious that the mentor Levitan suggested that it was not easy to draw, but to put all his soul into the paintings. The landscape should be natural, not sketched – this is the main feature of creativity. 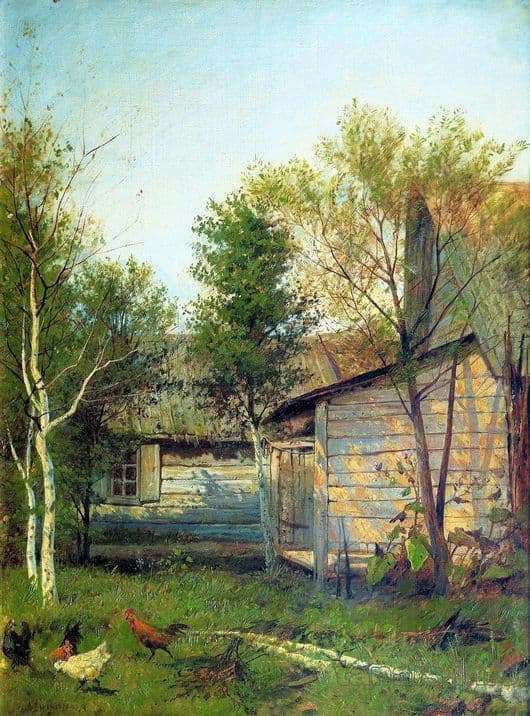 Levitan’s work “Sunny day. Spring “includes the ease and awesomeness of the environment. A cozy rustic corner surrounded by beautiful trees is depicted. The house is made of wood, which proves the simplicity of the Russian soul. The location of the living corner seems to be in the shade, but the sun still breaks through the slender birch trees, illuminating the rest of the yard. Green bold undertones perfectly show youth and purity of the surrounding world. The windows are very small, as if behind them lies the secret of the life of people. The appearance of the wooden house attracts family happiness that reigns inside. Poultry in the yard shows the person’s economic and his responsibility. Exceptional nature is the main inspiration of Isaac Levitan. Traced by the naked eye the desire of the artist, to show the inner beauty and fragility of nature. Undoubtedly, the early work of the master blows his youthful realism, because the colors are so bright and catchy. The presence of comfort in the picture of Levitan impresses the viewer and makes you plunge into childhood, where there is a rustic simple corner of happiness.